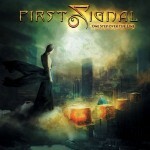 Share the post "Album review: FIRST SIGNAL- One Step Over The Line"
Even by the standards of the production line mentality that bedevils the melodic rock genre, First Signal’s second album may appear to risk a lack of cohesion. The one survivor from the team that created their 2010 debut is Harem Scarem vocalist Harry Hess, but he is singing songs put together by no less than eight other songwriters or teams, while Daniel Flores and Michael Palace put the album together in Sweden with his vocals recorded in Harry’s native Canada. However my initial misgivings proved unfounded, as it is apparent from the opening duo of ‘Love Run Free’ and ‘Love Gets Through’, both uptempo anthems that reminded me of Foreigner and Signal, that he has the perfect voice for this collection of melodic rock, even though in his day job Harem Scarem largely moved beyond this style after their 1991 debut. Some songs are a touch bland or lacking in character with the formulaic chorus of ‘Broken’ being a case in point, but the highs more than make up for it, notably the lush ballad ‘Still Pretending’ and the double punch of ‘She is Getting Away’ and ‘December Rain’ where the choruses are outstanding. Most impressive are the British contributions which seem to have a little added grit in the songwriting, with ‘Minute of Your Time’ from the Tainted Nation duo of Ian Nash and Pete Newdeck coming over like the missing track from Shy’s ‘Excess All Areas’, and ‘Pedestal’ from the pen of Nigel Bailey reminding me of classic Brit AOR like Dare or Atlantic. This entry was posted in ALBUM REVIEWS, ALBUM REVIEWS (Mobile), All Posts and tagged album, AOR, Daniel Flores, First Signal, Harem Scarem, Harry Hess, melodic rock, One Step Over The Line, review. Bookmark the permalink.